Why solar ovens you might ask? Makerspace students started the flat pack origami solar oven project by investigating the Material World by Peter Menzel, in which they learned about other cultures around the world and the material possessions they might own. With this exploration they realized that in some cultures women and children cook over open fires, which is equivalent to smoking ten packs of cigarettes a day. University of Dayton engineering student, Erin Peiffer spoke to our students and shared her experiences in Nicaragua and her design of rocket stoves and roasters. Our students researched heat transfer, the flat pack business strategy of Ikea, and the paper manipulation of origami. Then our students were tasked to collaborate with a partner in the creative design, build, and testing of their own solar ovens that will pack into a suitcase that UD students will take to women in Sabana Grande, Nicaragua this summer. 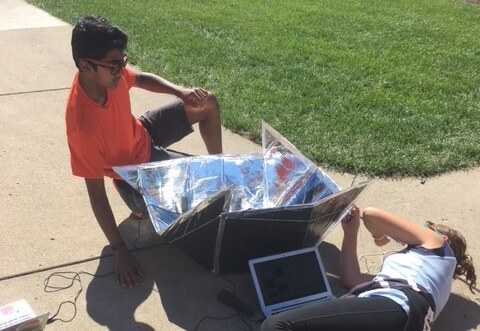 On Tuesday, October 9, Makerspace classes will have a “Solar Oven Cook-Off. Susan Kinne from Grupo Fenix in Sabana Grande, a University of Dayton ETHOS site partner, will visit MVS to talk with students, look over their ovens, and answer questions. She will be the representative distributing the ovens in Nicaragua.